℗&© 2007 Innervisions Copyright Control. All rights reserved. Distributed by Word And Sound (www.wordandsound.net). On backcover: "Wildpitch I Luv U!". Every Âme track seems to be a vast, cavernous anthem, and this, their tribute to the Wild Pitch sound, is no exception. For this Innervisions release, the follow up to ‘Rej’, they've ramped up the tempo and brought two tracks that are more twisted and closer to techno than any of their previous work. A hackneyed mission statement explains the shift in emphasis as a "move away from that clean sound that is penetrating us for the last two years". Âme are clearly feeling sore after this long penetration and are determined to tell the world they have never been "minimal", despite the fact that German artists distancing themselves from the m-word has become more boring and pointless than artists claiming the word ever was. In any case, Âme should relax, safe in the knowledge that their sound is too bombastic and orchestral for them to be easily written off as one genre or another. This 12” is a case in point. It opens with ‘Balandine’, a scorching 12-minute techno track that sounds like Hardfloor channeling Detroit. The track is built around a red hot riff and swells to frenzied proportions numerous times in a ‘Mouth to Mouth’ style. It’s pretty much guaranteed to be ubiquitous this summer, but only at the most intense moments. ‘Enoi’ is equally manic and equally great. Once again the track is built around a heavily distorted bass riff. There’s no intro, just a frenzied opening two minutes before horns that evoke alien communication in old sci-fi movies, or a bassier version of Oner Ozer’s ‘Red Cabaret’, tear through the track. This is a more workable track than the more epic ‘Balandine’ but is equally unhinged. After this, anyone who's ever found Âme’s deep house records "polite" may be converted, but perhaps some of their longer serving fans will feel a little alienated by this furious 12”. 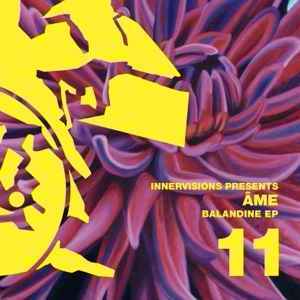 Still, when you leave aside the politics, the simple truth is that the Balandine EP is techno of a rare quality.